We all get wrinkles as we get older. They're a normal part of aging. If yours bother you, find out what causes wrinkles and explore your treatment options. With age, skin cells divide more slowly, and the skin's inner layer, called the dermis, begins to thin. That starts to undo skin's stretchiness and structure. Aging skin also starts to lose its ability to hold on to moisture, makes less oil, and is slower to heal. That all contributes to the wrinkling process. Lines between your eyebrows (frown lines) and lines jutting from the corner of your eyes (crow’s feet) are thought to result from facial muscle contractions. Smiling, frowning, squinting and other habitual facial expressions make these wrinkles more prominent. Getting too much sun damages your skin. That leads to wrinkles. To help prevent them, stay out of the sun between 10 a.m. and 2 p.m., and make it a habit to wear a broad-spectrum sunscreen with a physical blocker such as zinc oxide 7 % or higher and an SPF 30 every day, even in the winter and when it's cloudy. Wear a large brimmed hat and cover exposed skin with clothing, such as a long-sleeved shirt and pants. Smoking curbs your skin's production of collagen, which is a key part of the skin's structure. The downturn in collagen paves the way for wrinkles. That's one more reason to quit smoking, or never to start. There are many over-the-counter treatment options for wrinkles, including creams and lotions. Prescription treatments, including the retinoid creams Renova and Retin-A, and Altreno (tretinoin), are also an option. Dermabrasion (scraping layers away) and chemical peels (dissolving skin away) are two traditional methods for improving the skin's surface. Microneedling, with or without topical products, microneedling pens, intense pulse light, heat and light devices, and topical and injectable radiofrequency are also used. Laser skin resurfacing with an ablative laser (such as an erbium or CO2 laser) is another technique that, like dermabrasion and deeper chemical peels, may require some downtime for healing. 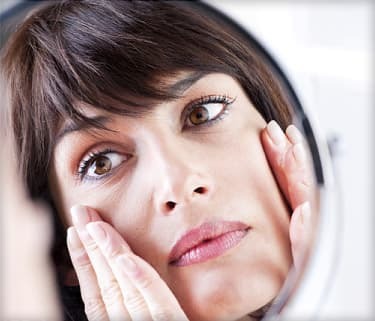 Other lasers, known as non-ablative lasers, may also help treat wrinkles. These lasers work by heating the dermis and stimulating collagen growth. This process, which leaves the outer layers of skin intact, has less downtime associated with it. However, the results are not as dramatic as the ablative lasers, which actually remove the surface layers of skin. Botox injections lessen the ability of selective muscle movement, which eases the appearance of expression lines around the eyes, forehead, and mouth over time to reduce wrinkles. Dysport, Xeomin, and Jeuveau are other neuromodulators like Botox. Fillers are injected into skin folds, especially around the mouth, to improve the appearance of wrinkles. Injections to fill hollows of the cheeks and temples bring about a lifting of sagging skin, especially around the mouth and lateral neck areas. Some fillers actually stimulate collagen formation, which improves the skin tone and texture. Thread lifts are also used to quickly lift sagging skin. If you are considering treatment for your wrinkles, ask your doctor which procedure is right for you.